What do you do when your Windows Update has been running for a few weeks and it still isn’t done yet? It seems that on older systems with limited CPU and hard drive space, the automatic Windows Update may in fact be a problem waiting to happen. The fact is, most automated update processes on a computer are going to be infinite – so the right title for this might be the never-ending Windows update. Imagine you have an older Dell workstation with about 450MB of free drive space on the C: drive. What do you think is going to happen when Windows update begins applying a a few gigabytes of changes to your system? First the good news. The update process is fairly intelligent, so while you may incrementally have a few gigs of data to download you’re only going to get as much as Windows can install at any one time. So as long as no single update is larger than the available disk space you should be able to get the update. “The net result is it may take a few weeks for some Windows updates to accumulate on your computer…”Unfortunately, when the updates run they will keep consuming the available space while attempting to leave enough disk space free for your other applications to run. The net result is it may take a few weeks for some Windows updates to accumulate on your computer and during this time your system will be running at greater CPU utilization with a hyperactive hard drive and a frequent tendency to reboot. In this particular case it was easier to wipe the computer clean and install Ubuntu, but this is really only a bandaid. In the long run, the only real solution is a new computer with a bigger hard drive. 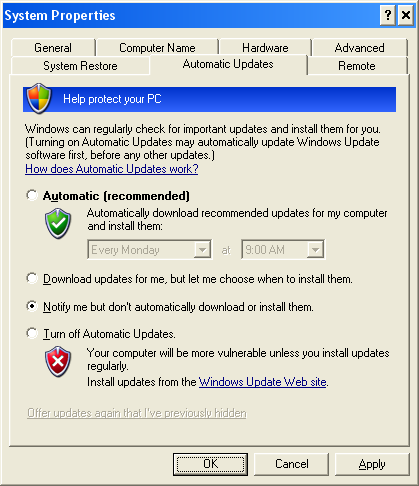 While you’re still running Windows XP on an older PC with limited drive space, be sure to disable the automatic Windows Update service and only apply updates when you’re sure you have enough storage available. After the software development lifecycle, programs experience certain evolutionary transitions. There is the moment of genesis when the initial application demonstrates capabilities in a proof of concept, but that is ultimately superceded by a succession of modifications that eventually jeopardizes the maintainability of that code. Apple has finally done what Microsoft should have done years ago, they have an App Store where programmers can sell products and take advantage of an instant electronic distribution mechanism.